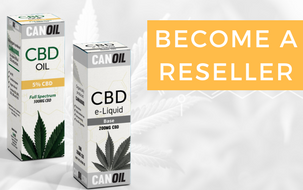 Canoil is the wholesaler for retailers, retailers or resellers within the CBD industry. To reseller or retailer for all your items, shop, advice or questions about our company visit. With very competitive prices and a huge wide network we can provide as a retailer sales boost you're looking for. Our products are in stock and comply with current legislation and regulations within European borders. Canoil is the first Dutch CBD e-liquid plant where CBD e-liquids under controlled conditions in a TUV ISO 9001 certified factory e-liquid is produced. Additionally controlled by the laboratory for each batch are liquids before it leaves the factory. All raw materials are produced in the Netherlands and are of the highest quality. So are the main components of the liquid from pharmaceutical grade ingredients and flavors from food grade ingredients. Our team has expanded enormously in recent years. After moving to the new building and the go live of our new website, we are currently working on automating our logistics processes, you as customer the security of supply that you are looking for. We work with passion and enthusiasm to expand our customer base within the EU. Not yet a customer? Register please to see our competitive prices or contact info@canoil.com. Our representatives are happy to help.